Hey, you found us! Welcome to our new blog, Canadian Doll Notebook!!! Here we are Christmas morning with our Cabbage Patch Dolls. Growing up in the 1980s Michelle and I were completely enamored with our Cabbage Patch Kids and Barbie dolls. These dolls were by our side throughout our childhood keeping us company when we were lonely, enduring makeovers, wardrobe changes, and most importantly as fabulous actors in the plays we created. Then things changed… we grew up got older, and didn’t play with dolls anymore. Giving up on the internet we set out looking on our own for that special doll. We started talking to friends and family, visiting numerous toy stores, and hunting on Kijiji. On our journey we have evaluated numerous dolls in order to find the “perfect doll” for our girls. Through this process we have learned a lot, accumulated a lot of dolls and accessories, and have done our fair share of dolly repairs. So Michelle and I got together, and created this truly Canadian doll blog, a place where we can share our Canadian doll notes. Here we will review dolls and their products that are available in Canada, and use Canadian dollars. We will also share tips for doll care and repairs, doll inspired crafts, and activities all with products available in Canada. Maybe we will even do a Canadian giveaway or two… we love giveaways! We invite you to share in the adventures of two Canadian friends, their five daughters and numerous Canadian dolls! Hello, fellow Canadians! I live in Vancouver BC, with roots in Three Hills Alberta where my paternal grandpa lived from 1910 – 1918. He relocated to Spalding SK where my Dad was born, then they all moved here in 1941, 75 years ago. I just discovered your blog today and am very happy to find it. It looks well done and very informative; thanks! I’m a doll collector; my very first doll was given to me at the age of 6 months; it was as large as me, and was made by Dee & Cee, a Canadian company which also produced the Chatty Cathy talking dolls for Mattel in the early 1960’s. I have my original Chatty too, which I got in 1964. I’ve written about many of my dolls on my blog under the label “dolls”. I’ll keep in touch! Glad you found us too! Always happy to meet another Canadian doll collector. We are not far from Three Hills, funny thing is my husband is there today coaching! 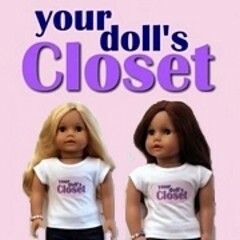 I know a little bit about the Chatty Cathy dolls from our friends at the Calgary Doll Club. I am going to take a trip over to your blog now. I am looking forward to it! Thanks for stopping by, Walter! Sorry I have never heard of that brand of doll before. Have you tried dollation.com?